Diversion Publishing - Ips, 9781635761764, 288pp. From Startup Leadership author, global CEO, and entrepreneurship expert Derek Lidow comes the new, foundational guide to entrepreneurial success. We all dream about achieving some combination of the fortune, fame, and control over our lives we associate with successful entrepreneurs. Those are admirable aspirations in a society that counts on entrepreneurs to innovate and create new jobs. Our work-driven culture encourages us to take the entrepreneurial bait, but how can you know whether being an entrepreneur will end as a dream come true or a nightmare from which you cannot wake? Building on Bedrock helps answer that question. 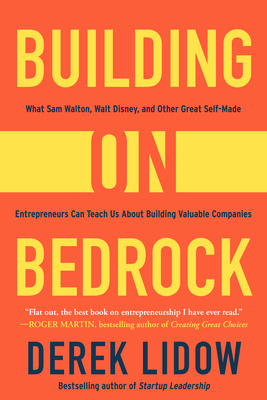 Based upon research, but told through the stories of American entrepreneurs Sam Walton, Walt Disney, Estée Lauder, Ray Kroc, and others, Building on Bedrock will help you understand the elements most essential to taking the entrepreneurial leap. Was it luck, talent, passion, charm, a rich uncle, or something else that was the key to this person's success? Which might be the key to your success?